The German geologist Christian Leopold Freiherr von Buch (1774-1853) was one of the most known geologists of the first half of the 19th century. Educated as a Neptunist, he became quickly interested in volcanoes and their deposits and therefore decided to visit the nearest active volcanoes. So in 1800 he travelled by feet from Germany to Italy, taking with him only one dress, a note book, a barometer and his hammer. 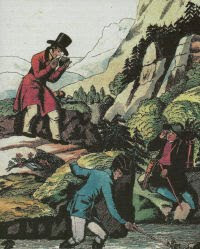 He was the first to study in detail the outcrops of reddish rocks surrounding the South Tyrolean city of Bozen and recognized them as volcanic products and named them appropriately: Bozner Quarzporphyr - quartz porphyry of Bozen. Fig.1. 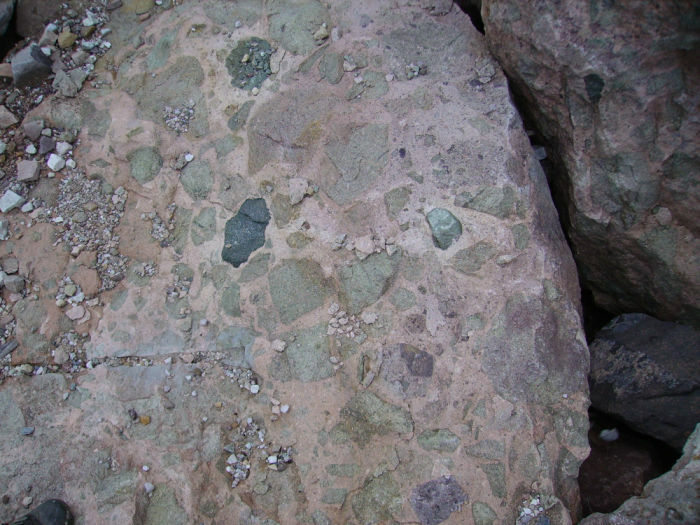 Example of typical "Bozner Quarzporphyr", this term encompassed very different volcanic facies, like ignimbrite rich in feldspar crystals and flattened clasts (in the photo) deposits, lava flows and even clastic fluvial sediments, only in the last decades a more specific approach and distinction was adopted. This complex reaches an incredible maximal thickness of 4.000 meters The precise age, origin and geotectonic significance of the Permian magmatism in the Southern Alps is still controversial, one (classic) model propose that the intense volcanism was triggered by the extension of the lithosphere during the break-up of the supercontinent of Pangaea, a second model interprets the volcanic rocks as the magmatic arc of a nearby (today not preserved anymore) subduction zone. Early interpretations suggested that the Bozner Quarzporphyr is mainly a homogenous infill of a gigantic volcanic caldera. 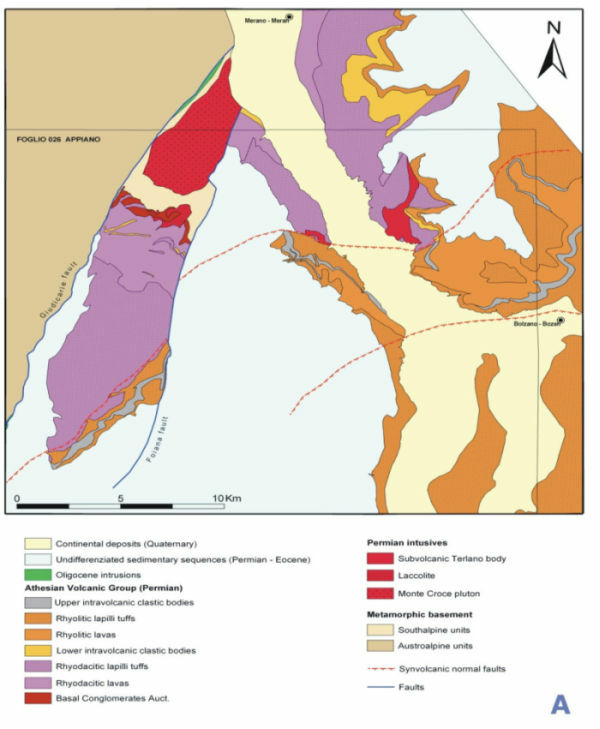 However the Athesian Volcanic Group (the modern term) is a complex succession of both plutonic, magmatic and sedimentary rocks, it consists of volcanic episodes with pyroclastic density currents, ash- and tuff-layers, lava flows, clastic and limnic sediments of erosion phases during volcanic resting phases and intrusion of plutonic rocks, that became uncovered by tectonic movements and erosion. Fig.2. 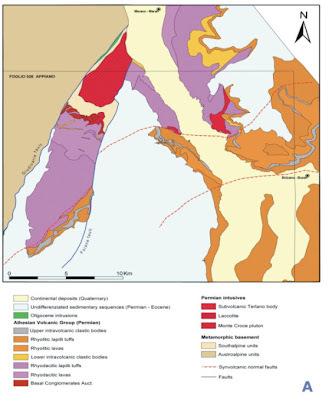 Geological map of the eastern part of the Athesian Volcanic Group with supposed borders (stripped line) of former caldera, after BARGOSSI et al. 2004. Fig.3. 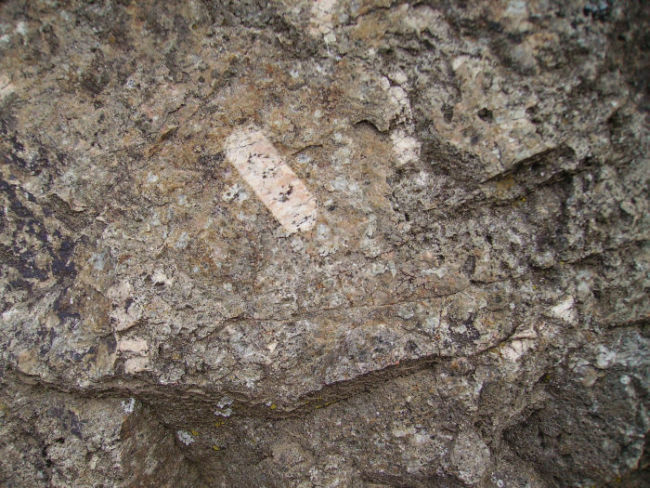 Example of intruded plutonic rock in the volcanic rocks of the Athesian Volcanic Group, feldspar-porphyry of the Terlano sub-volcanic body. 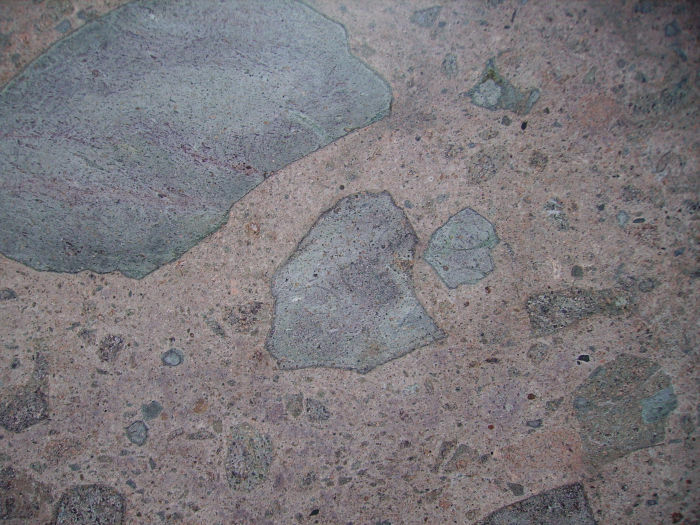 Many of the various volcanic rocks were and still are used in construction and especially as paving stone. The Nalles-Formation consists of a sequence of events which produced an aesthetic volcanic breccia. This tuff-breccia is organized in very thick parallel beds, made by variable portion of volcanic, angular to poorly rounded, large clasts swimming in a matrix of crystal fragments and ashes. Some of the larger fragments show a coloured rim as results of thermic alteration. This facies was obviously deposited still quite hot, in a high energy regime capable to transport at the same moment fine particles but also large boulders - this suggest that these are deposits of repeated pyroclastic flows (which even maybe killed at least one poor reptile). Fig.4. Nalles-formation with large clasts swimming in a matrix of crystal fragments and ashes. Fig.5. 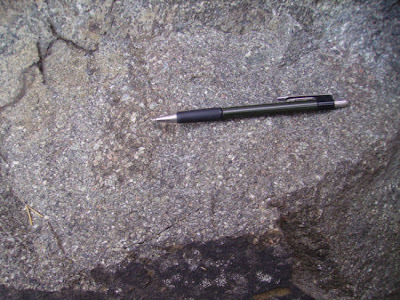 Detail of larger clasts with thermic reaction rim.